Andres St. Claire is a Dreamer who got protection under DACA. But before that, he was in love with Jazmine St. Claire, with whom he shared an immigrant experience and a love of video games and dogs. 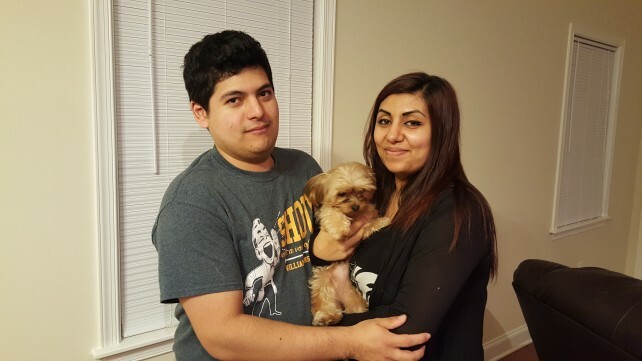 Jazmine, who is originally from Pakistan but is a Canadian citizen who was living in Canada, moved to the U.S. to be with Andres. She obtained residence, but Andres’ initial entry as a child from Mexico made it very challenging to seek residence for him. They married in 2010. Andres was one of the first kids to obtain DACA. To petition for Andres, Jazmine had to become a citizen. When that was done, she petitioned for him. But Andres would either need an I-601A provisional waiver and to seek an immigrant visa in Juarez, Mexico to get his residence. However, under relaxed guidelines for advance parole, Andres was able to travel to Mexico to visit family. He returned to the U.S. lawfully on parole. This allowed him to seek residence, which was granted last month. Jazmine and Andres live in Harrisonburg in Virginia’s beautiful Shenandoah valley. They are both commercial forklift operators in a giant warehouse, but are taking turns going to school to be nurses. They are lovely people and we are so happy for them and for America to have them among us, safely out of reach to whatever the new administration chooses to do with DACA recipients. Congratulations to both of you !!! Play your Trump cards ahead of Trump. ???????? !! !